This is the first in a series (of indefinite length and regularity) of examinations into different games, events and decisions that impacted Knicks history in some way, shape or form. Stories that are not as famous as, say, LJ’s 4-point play or Willis Reed playing Game 7, but still have a place in Knicks history, especially for die-hard fans. Here is an archive of all the stories featured so far. Today, we begin the series by showing how, for the want of a half-game, Bruce Bowen failed to become a New York Knick. 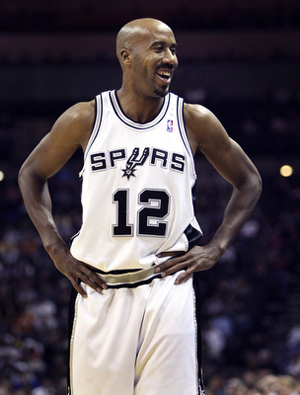 Bruce Bowen certainly had an interesting career in professional basketball. After graduating from California State University, Fullerton, where he played for four years, Bowen went undrafted in the 1993 NBA Draft. He then spent most of the next four seasons bouncing back and forth between Europe and the Continental Basketball Association (CBA). In 1997, he finally got his big break, getting signed to a 10-day contract by the Miami Heat. Bowen only played 1 game for the Heat that season, playing 1 minute and having 1 block. The next season, 1997-98, however, he got picked up by the Boston Celtics, where, at 26 years of age, he had his first real season in the NBA. He played pretty well for the Celtics that first season, but he took a significant downturn in 1998-99 and the Celtics let him go after the season ended. For the 1999-2000 season, he signed with the Philadelphia 76ers. Bowen’s problem on both the Celtics and the Sixers was that he had very limited offensive skills. He was really designed for one thing, offensively – hitting the open three pointer on a kick out. The Celtics did not have much use for such a player and while the Sixers did have Allen Iverson driving and (occasionally, if his teammates were lucky) kicking out, Larry Brown was happy with the player he had at small forward, George Lynch – a strong defender who had a more varied offensive game than Bowen. And with the Sixers having such a putrid offense overall (they ranked 25th in the NBA in offensive rating in the 99-00 season), they could not find ways to keep Bowen on the floor. He averaged less than eight minutes per game for the Sixers in 99-00. However, one game that he did play sizable minutes was in a 74-70 victory over the New York Knicks early in the 1999-00 season, and you better believe that Jeff Van Gundy remembered how well Bowen played both Allan Houston and Latrell Sprewell that game (Houston shot 5 for 16 and Sprewell shot 6 for 18). The 1999-2000 season saw the New York Knicks and the Miami Heat in a pitched battle all season long for first place in the Atlantic Division and a #2 seed in the Eastern Conference Playoffs. The Heat started strong while the Knicks had a tough time early on with Patrick Ewing missing the first 20 games of the season (and Marcus Camby also missed a few games – heck, in the aforementioned Sixers game, the Knicks starting center was Andrew Lang!). After 20 games, the Heat were 15-5 while the Knicks were 11-9. However, the Knicks were just starting a five-game winning streak and by the end of the calendar year in 1999, the Heat were 19-9 and the Knicks were 18-12. Neck and neck they went, with the Heat always staying one step ahead of the Knicks until, after a Knick victory and a Heat loss on February 21, 2000, the Knicks finally passed the Heat. The Knicks had a record of 32-19 as compared to the Heat’s 32-20, putting the Knicks in first place by a half game, their first time in first place since the fifth game of the season! The Heat took back first place two days later and held on to the spot for the rest of the season. It matters because of what else happened on February 21, 2000. You see, the previous week, the Chicago Bulls had come to the same realization that most others had come to much sooner, which was that trying to rebuild a team around a 31-year-old Toni Kukoc was probably not a good idea, so they finally traded away the final star player from the last Chicago Bulls three-peat. Kukoc was traded to Philadelphia in a three-team deal involving the Sixers and the Golden State Warriors. The deal was basically strictly Kukoc for the Warriors’ first round draft pick in 2000 (which ended up being the 7th overall pick – the Bulls then flipped it for the 8th overall pick, Jamal Crawford), while the Warriors picked up Larry Hughes and the Sixers got Kukoc. For salary cap purposes, the Bulls also received Bruce Bowen and John Starks. While they held on to Starks (and by the time they waived him, Starks was no longer eligible to play in the postseason), they quickly waived Bowen, as they really had no use for him. Pat Riley had seen Bowen in 1997, and Bowen also had a strong showing against the Heat in a December 1999 game, where he helped shut down the Miami perimeter game, so he was interested. Van Gundy, obviously, was interested. 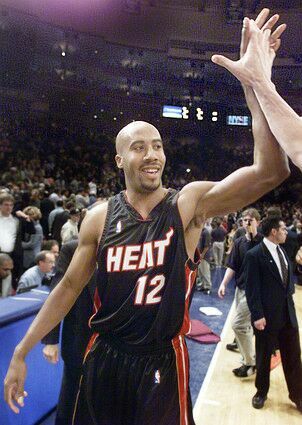 Both teams put in waiver claims, but by virtue of being technically in second place when his waiver claim came due on February 21, 2000, the Heat were awarded Bowen’s services. He was a factor in the 2000 Playoffs but was an even bigger part of the 2000-01 team, where he became a starter and his ability to hit the three on the kick outs fit right in with a team offense built around Alonzo Mourning in the middle. He also made the All-NBA Defensive Team (second team) for the first time in his career. He would then sign a big contract (for a guy like Bowen, at least) with the San Antonio Spurs for the 2001-02 season (another team where he would get open looks from kick outs in the middle, courtesy of future Hall of Famer Tim Duncan), where he would go on to make the All-NBA Defensive Team a remarkable seven years in a row, the last five being first team selections. From the start of the 2002-03 season until the end of the 2006-07 season, he started every Spurs regular season and playoff game as the Spurs went on to win three titles in those five years. Can you even imagine what would have happened had the Knicks just been slightly behind the Heat in the standings that night? Would his game have fit in with the Knicks offense? Would the Glen Rice trade have still happened? Would Shandon Anderson ever have played for the Knicks? So many possibilities, and all because of the want of a half-game. If you have any suggestions for future Unsung Knicks History pieces, drop me a line at cronb01@aol.com! I’d prefer you share your suggestions via e-mail rather than in the comments section, so we can keep them a surprise! Thanks! Neat story and one that passed completely under my radar back when it was happening. Keep ’em coming. all I can say is…WOW…great article…what if? After reading your story, I actually remembered when the Knicks lost out on Bowen, and it annoyed me, yet didn’t trouble me too much, because, who knew that he would become such a difference maker? But it seems so long ago, doesn’t it! I’m looking forward to the Knicks turning over a new leaf this forthcoming season. Good article, Brian. I don’t know how much difference this would have made, but it couldn’t have hurt. Thankfully, we are finally out of the Dark Ages and have a young, promising team, a decent coach, a top-notch GM and a favorable cap situation to look forward to. A big step in my 3 year , championship team plan posted on June 23rd has occured. Garnett/Camby type defender and Gallo into a Peja/Dirk Scorer. Felton, Amare, Gallo , AR Chandler can get us to the playoffs. 2011 – Sign Melo and keep the rest of the core. The extra year of Gallo and AR development , plus Melo Amare Felton puts us into the 2-3 seed zone. 2012 – Sign Paul or Deron … one of them will be available. Then extend Gallo and AR as we can go over the cap signing our own players. Felton comes off the books. Always thought the retirement of Buck Williams just before the strike shortened Cinderella run was one of those little things. Not that Buck would have made the difference against the Spurs, but we missed a dependable, scrappy leader down low to match up against the big 2. Hmmmm. How about how the Knicks almost signed Albert King and Harvey Grant as free agents? Layden would have traded Bowen for a fat, 6’7″ power forward or a guy from either the Jazz or the University of Utah. I fear that Layden was too incompetent. But Camby-Thomas-Spree-Houston-Ward + Bowen, ‘Spoon, cap space would have been a very good situation, esp. in a wide open East. thanks. that’s a great story. i think it is more impressive for bruce bowen’s fortitude. wow, what guys achieve when they really stick to IT. where would san antonio’s legacy be without this piece! how about “How LeBron was Nearly a Knick”? @5, unfortunately, that scenario is impossible under the current CBA and probably even less likely with the new CBA. You can only sign your own players to exceed the cap if you do not have enough cap-room. If you renounce their rights, you free up the cap room to sign a player. In other words, the Knicks couldn’t have signed Amar’e, LeBron, then signed Lee to exceed the cap, as they would have had to renounce Lee’s rights in order to create the cap-room. Otherwise, he would have had a cap-hold on the Knicks. If they sign Carmelo next year (will take a trade or two to give him the max or close to the max) the only way to acquire Paul is to do a S&T with the Hornets (assuming the structure of the future CBA allows this) or if Paul takes less than max, and that would probably take the Knicks to gut their team ala Heat to fit the third max. Forgot the other option would be to do a straight up trade for Paul (thereby giving the Knicks his bird rights) and then extending him to the max, exceeding the cap. Bruce Bowen did nothing against the Knicks in their 7 game series in 2000 (he played in all 7 games but only for a total of 87 minutes and scored 19 points on 5 for 16 shooting including 3 for 14 from 3 pt range) BUT I will never forget the only 3 points he scored in Game 5 since it was a 3 pter with less than a minute left that doubled the Heat lead from 3 to 6 to basically seal the game for the Heat. I haven’t been able to register for months now but I’ve been following this blog for a while. It’s funny that we are reminiscing about the ’90s Knicks still. Truth is, it got so brutal that I stopped really watching for 6 years (I caught a few of the Starbury games before it went down the tubes). The only positive moments in the past decade that I can actually recall were GM signings (Donnie) and coach signings. Hell, Larry Brown was something I supported too. Even the good moves have stunk for the Knicks. I can’t recall a time I’ve been so excited to watch the team again. Watching Gallo/Chandler develop over the last two seasons have been fun, but I’m hoping it’s more than developing and losing this season. Depends on how you look at it. We don’t have Stoudemire’s exact salary figure for 2012-2013, but based on the reported total (5 years, $99 million), it’s about 19.8 million. Currently, that’s the only salary the Knicks have on the books. If they add Anthony (or anyone) at a max contract next summer, they’ll take up another $17-18 million. Depending where the cap comes in, the Knicks probably have $20 million-plus, to spend on Chris Paul or Deron Williams. Of course, they’d have to renounce everyone to do it. But the Q offers for Gallo and Randolph are $9.6 million, total. Toney Douglas is another $2 million. The 2011 draft pick is another $1.5 million or so. Not that this is a good idea!!!!! There are many better ways to spend $17 million, than on Carmelo Anthony. But it’s not like it would close off all the options… . Caleb, are you sure you can extend qualifying offers to Randolph or Gallo if you are near the cap? I do not believe that is how it works, but I could be wrong. They’d have to renounce them in order to free the cap room, thereby, losing their rights. @18 – The Knicks will probably be nowhere near the cap – they only have $19 million in salary committed for 2012-2013. In the scenario I laid out, they’re $12-15 million UNDER the cap, even with the qualifying offers. You can go over the cap to sign your own players, so you can extend qualifying offers even if you’re over the cap. Still, the Q offer counts against the cap, unless/until the players are renounced (or the player signs an actual deal for less (or more likely, more) than the Q offer). If the Knicks had $10 million in cap space and Chris Paul wanted $15 million, the Knicks could get there by renouncing Gallinari, or removing his salary by trading him for a future pick, or as part of a Paul S&T. In practice, they probably do have room for 4 “big-time” players – Stoudemire + max or near-max guy in 2011 + max or near-max guy in 2012 + either Gallo or Randolph, going over the cap to sign their own player. There’s a chance of fitting 5 “big-time” players, especially if they can get FA stars at a slight discount a la Miami, or if it’s someone like Al Horford for, say, $12 million under the new CBA, instead of Anthony for $18 million. Having said that… the new CBA, next summer, could change all these rules completely. Right, that’s what I understand. I posted originally that the Knicks would have to gut their own team to do this. I believe Stat is projected at 20 mil. What I meant was that they’d have to renounce gallo/randolph or both in order to open up enough cap room for Paul unless it’s through a trade, and thereby, not being able to extend a QO to either or both (depending on what the roster looks like in 2013 and the cap space/new CBA). @11 – That article made me feel sick, Jon!! Let’s just focus on the Bruce Bowen thing; it’s much less painful. I really think we need to stop talking about Carmelo Anthony. There are people that think we overpaid Amare, which is possibly true but getting a bona fide star was worth it for the Knicks in this case, and I think most here agree with that. But if you think Amare is overpaid, what would giving Anthony 17 mil starting look like? Comparing Anthony and Stoudamire, you see that Melo doesn’t really even compare to Amare, much less James or Wade. There is only a 2 year difference between the two, but Stoudamire is clearly a better player, especially in Win shares. And for those of you moaning about Randolph’s relatively low TS% at such a young tender age, a ‘superstar’ like Melo is still below 55% at age 25. Neither his rebounds or assists are really better than average, and I don’t believe he has a particularly great reputation for defense. You could say that Amare is a one trick pony – efficient scoring – but that’s better than Anthony’s one trick – volume scoring. It’s not that Melo is awful – but based on what he does, he’s probably ‘worth’ closer to 13 mil a year, if that. The fact is, Anthony is much closer to Iverson than James or Wade and isn’t worth the money he will eventually get (he’s crazy to turn down the extension.) We are much better off trying to turn our current forwards (Gallo and Randolph, Chandler) into stars and our wings into good complimentary players (Buike, Walker, Fields.) Oh, and going for a major upgrade at point guard with CP3 and possibly Deron Williams. Even an upgrade at the 2 or 5 would be more worthwhile. Maybe CP3 and Dwight Howard in 2012? Or next year with Horford or Noah? Great points ess! I never really thought of it like that. While ‘Melo is arguable the deadliest scorer in the league..he is less effiicient than I would like for him to be. Don’t get me wrong, I’d love to have him..but 2 scorers like Melo and Stat on the same squad doesn’t really sound enticing without a PG that can maximize the 2. Both of them score..and score well..but they don’t really generate (for lack of a better term) points. I guess what i’m tryin 2 say is they haven’t shown the ability to create for others, in other words-make others better. Melo looked WAY better once Billups came in town. He’s always scored at a high clip, but it wasn’t until Billups arrived when ppl finally started appreciating his game. That said, while I would love Melo as a Knick, a great PG is the better option. Besides if Gallo and Randolph improve as expected, and we were able to add CP3 or Deron Williams, then we wouldn’t need Melo. Imagine…Stat, Randolph, Rooster, (insert 2 guard here), CP3/Williams as a starting lineup..wow. @22 I see your point re: Melo, but would still like to get him, even near at max, so long as it doesn’t cost us Gallo or Randolph (unless they don’t develop.) There is a reason he goes to the line more than Amar’e, and it is not just that he shoots a lot. In the past 2 years, he elevated his game in the playoffs and all of his numbers went up, his TS% was .564 in his last 22 playoff games. It comes down to, is he coachable? Can he learn to defer more and up his rebound and assist numbers? Can he pick it up defensively when the DEE-FENSE chants rain down at the Garden? He certainly has the physical tools. I think a big this Melo brings to the table is that he is a WINNER. He lead his team to the championship in syracuse, and has kept the nuggets in the top half of the standings yearly. His teams havent been amazing, and he still manages to keep his team in it. We have had such a losing mentality for the past 10 years , that i think we forgot what it takes to get to the playoffs. Stat is a winner. Melo is a winner. Felton has been a Winner at NC and lead his team to the playoffs last year. Remember the days where making the playoffs was a certainty? I dont. Lets get back to those days. I am not so impressed by Kevin Pritchard… he gets a lot of ink from his ability to turn trades at a frenzied pace, on draft night… he’s pretty good at stockpiling… and yes, he built up the team from a dark point where the fans were really giving up on them. He’s good with the public, and knows how to run a team. But on talent evaluation, I think the record is more like a B, than an A+ superstar. The big draftees were basically consensus picks.. Oden #1… Roy #6… Aldridge #4… a mixed record on the others picks… Batum, Fernandez, Bayless, outlaw.. Same with the FA signings. Andre Miller for $7 million, Przybilla and Blake for the mid-level… ok, I guess. Camby was savvy, saved a lot of money by not waiting until summer. On the other hand, he offered Turkoglu the same $50 million we think is ridiculous now. Check out this wildly optimistic study done by an actual statistician re: our projected wins (48!!!) for next year — via theknicksblog.com. Not sure whether any of these stats are valid since fully 3/5 of our projected starting lineup were playing for other teams and systems last year. but it makes for an interesting read. Caleb – I’d rather have a GM that is a B, than to get anything worse. That’s the big fear – to go from where we are now back to a Thomas/Layden type that just destroys the franchise. It’s so hard to right a wronged ship in the NBA that I don’t want to wait a decade to have another opportunity at a winning team. @30 I know what you mean – we Knicks fans are a traumatized bunch, afraid to come out of our bunker. With good reason, seeing the current ownership. Is Isiah really under consideration? Or is that total spin from Isiah’s camp? Or a favor from Donnie, to drum up respectability that could help IT land a different job. In NY, there are still a lot of unknowns about the GM position. Like, will this person be a pure subordinate to Walsh, or are they promised the top job in a year or two? Etc. I think the important thing to note about Melo is that, while basket-reference.com and advanced stats show him to be rather unimpressive, his game itself is very impressive. I’ve always felt Melo took more shots than he needed to because on his team, good outside shooting (JR Smith is streaky as hell, Chauncey’s the only solid outside shooter who’s also somewhat streaky and getting old) was difficult to come by. When he’s on top of his shot, he is a tremendously efficient scorer, whereas when his shots don’t fall, he obviously isn’t. He’s got one of the smoothest post games I’ve ever seen from a small forward, and is arguably the best post scorer in the league on an inside/outside basis. I think with Amar’e taking a load off, Melo not having to settle for a lot of outside shots, the inside out game with him and Amar’e with the Knicks’ current shooters could make Melo look a helluva lot better than his current advanced statistics show. Sure, he could put a bit more effort into rebounding and defense, and the talent is surely there. But put a good defensive bigman next to him and Amar’e, a couple of good shooters on the outside, Melo could be scary good in improving his scoring efficiency. I kind of appreciated Jeffries when he was around, but I don’t miss him at all. D’Antoni/Walsh must really like him if we’re trying to get him back (albeit for Curry). It’s good that we only bring in players whose contracts expire in the next 1 – 2 years. Shot 38% from 3 for career. Budget signing. Good for depth. Melo is going to get the max. Statistical analysis aside, he’s the best player on a playoff team. He’s durable and he gets points the hard way oftentimes. If the Knicks can sign him they totally will, and should in my opinion. If he doesn’t sign an extension, Denver really ought to consider trading him, as he’s clearly not interested in the money or staying. Then, it would behoove them to trade Melo to a team that he’d resign with (since other teams wouldn’t want to rent him for a season). Maybe Curry/Chandler/Azubuike or Turiaf plus a 2014 draft pick or something. Not full value for Melo, but we could get him in a year for nothing if he’s determined to come to NY. Big picture, got to give credit to Donnie for getting us back in good position with a bright future in just 2 years.